Hello, I’m Cobain! I am 8 years old. I have Tony Hawk shoes, long blue hair, dark eyes like chocolate and a wiggly tooth. My tooth just won’t come out. It has been loose for 9 weeks, 3 days and 7 hours. I have been keeping track of time and counting because my wiggly tooth is driving me nuts. I feel my loose tooth with my tongue all day long! Sometimes when I am bored in class, I push my tooth all the way back, trying to make it fall out. It is stuck! I am going to have to do something. Uhhh, yeah! I thought to myself. My mom can pull this tooth out for me. I ran into the kitchen as fast as Super Mario. “Ouch! What the heck?” I screamed. “Did it hurt?” Uncle Justin asked. Cobain Leftwich is a native of Colorado and currently lives in Denver with his mom. An old soul, he loves the 80’s era and video games, especially pinball. He hopes to one day be a T-Rex, but will settle for rock star, break dancer, or both. This entry was posted in Fridge Flash and tagged Cobain, fridge flash, kids art, kids flash. Bookmark the permalink. Can’t even tell you how much I love these fridge flashes. My son commented on my behalf earlier, but I just wanted to say thank you to SLQ for this platform for kids to be able to showcase their writing. What a wonderful way to allow kids to proudly display their talent! Thank you so much! He was very excited to see this up on your website. 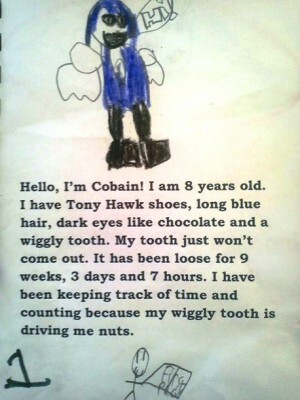 Well done, Cobain. I’m not sure what brightened my day more–your story or your witty bio. I, too, hope to one day be a T-Rex. My hunch is that you, one day, will be a well-known writer. Never give up on your dreams Anthony…especially if they involve a T Rex. 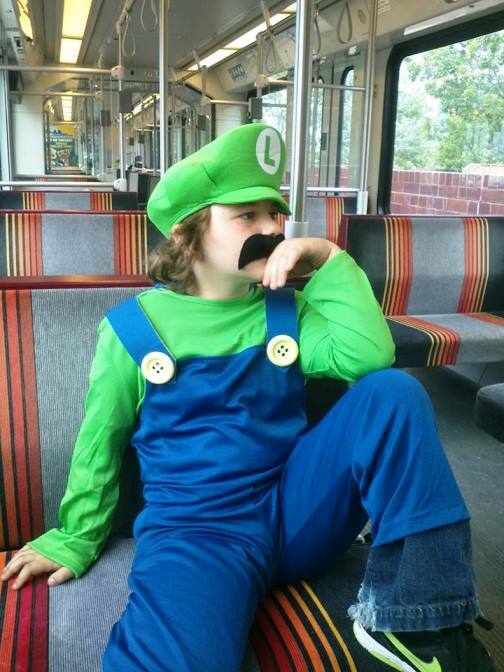 Thank you for the comment on my son’s story. You are wonderful. Nice one, Cobain. We’ve never met because as long as you’ve been alive, I’ve lived in Australia. But, I used to work with your mom, and she rocks. So, you must rock as well. Loved the story. Pesky teeth. I can feel your frustration in your writing! Love it!